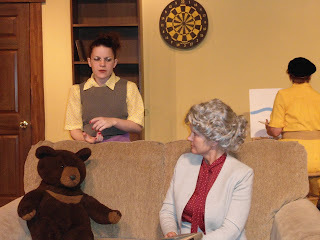 Putnam County Playhouse: "The Curious Savage" Opens on July 12!!! "The Curious Savage" Opens on July 12!!! L-R - Alixandra Green, Bethany Bax, Sandra Rossok in rehearsal. The Putnam County Playhouse production of The Curious Savage a comedy by John Patrick will be presented July 12-14 and July 18-21. All performances are at 8 p.m. Tickets are $10 and can be reserved by telephoning the box office at 765-853-5880 after 5 p.m. beginning Monday, July 9. Directed by Jack Randall Earles, The Curious Savage tells the story of Ethel Savage (Bethany Bax) whose late husband has left her ten million dollars. She is in the process of spending it all to help those less fortunate than herself, when her three stepchildren (Kathryn Dory, Don Collins, Clarence Long) decide to have her committed to a sanitarium to prevent her from spending their inheritance. While living at The Cloisters, Ethel becomes involved in the lives of the residents there. Florence (Tammy Hunter), Fairy May (Alixandra Green), Mrs. Paddy (Sandra Rossok), Hannibal (Don Wilson), and Jeffrey (Kenneth Lee Buchanan) who are all there for treatment. Helping them along are Dr. Emmett (Jim Rambo) and Miss Wilhelmina (Shalynn Branscum). Bethany Bax last appeared here as Ruth in Blithe Spirit. In addition to her many appearances on our stage, she has directed shows including Barefoot in the Park and To Kill a Mockingbird. Kathryn Dory played a leading role in Nunsense. She has also been musical director for productions including The Sound of Music. Don Collins appeared last season in Don't Drink the Water. He played Willie Clark in The Sunshine Boys and was also in All My Sons among others. Clarence Long has appeared in Kiss Me Kate, Cheaper By the Dozen, and Arsenic and Old Lace. Tammy Hunter played Marion Hollander in Don't Drink the Water and has also appeared in Never Too Late, Footloose, and Kiss Me Kate. Jim Rambo directed Don't Drink the Water and has appeared in many productions including On Borrowed Time and A Funny Thing Happened on the Way to the Forum. Alixandra Green has appeared in many musicals including Camelot and Singin' In the Rain. Sandra Rossok has been many productions, most recently Don't Drink the Water and Arsenic and Old Lace. She is also the assistant director for this production. Don Wilson most recently appeared in The Music Man and Don't Drink the Water. He was also in Man of La Mancha and Blithe Spirit. Kenneth Lee Buchanan appeared last season as Lancelot in Camelot. He was also in The Music Man, Kiss Me Kate, and Never Too Late. Shalynn Branscum previously appeared at PCPH in Never Too Late. T.J. Tincher is stage manager for the production. Jim and Melissa Green are working on the technical side of the show. Linda Gjesvold designed the set. Ben Fisher is assistant stage manager and Rossok handled the costuming for the show. Special thanks is given to Harris Weltz. “The Curious Savage” is sponsored by Rossok & Co. Insurance and Pekin Insurance. Click HERE to read more about our Sponsor!! Children's Theatre Workshop in July! !